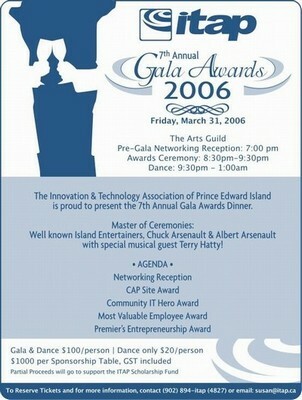 Grab your Blackberry, boot up your Outlook, whatever it takes, but don't forget to block off Friday, March 31, 2006 from 7:00 pm to 1:00 am at The Guild for the 7th Annual ITAP Gala Awards. Tickets are going fast, so purchase your tickets or sponsorship now! Gala Award/Dance Tickets ($100 per person) or Dance Tickets ($20 per person) can be purchased either by phone at 894-4827, or by emailing Susan. ITAP is rolling out a red carpet evening of food, wine, conversation, and laughs (courtesy of Chuck and Albert). This year's awards include the Premier's Entrepreneur Award (yes, presented by the Premier! ), Most Valuable Employee Award, Stephen Dennis Memorial Award, and the Community IT Hero Award. Of course, no evening would be complete without music! Island musicians Kirk White, Deryl Gallant, Donnie Bowers and Tim McPherson (with very special guest, Terry Hatty) will be there to help us party the night away! 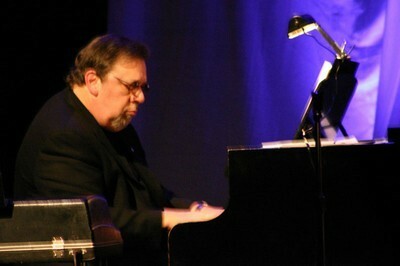 Part of the proceeds will go to support the ITAP Scholarship Fund.